Enjoy a tour of Pylos, and learn about the rural life in Russia. Then, arrive in the historic city of Kostroma, part of the Golden Ring of Russia, and the cradle of the Romanovs. Your day begins with a visit to the Kremlin, the intriguing seat of the former Soviet Union. In the State Armory, you’ll see priceless weaponry, jewels, and ceremonial robes. 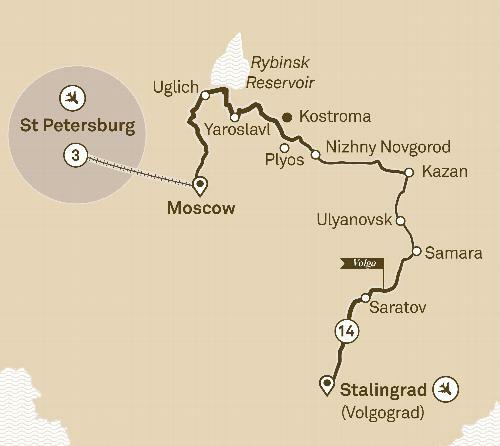 Many wonders of Russia will be revealed on this epic journey, starting in Stalingrad (Volgograd) where you will board Scenic Tsar for your luxury Russian river cruise. To travel along the Volga River between the two great cities of Stalingrad and Moscow is a step back in time. However, Russia offers up many additional surprises, with culinary delights, welcoming locals and spectacular scenery to enjoy. Travel by train from Moscow to St. Petersburg where you will spend three nights in this wonderful city.